Some people collect coins , others collect card but I collect shoes. I love shoes especially when I find a shoe that I love that is on sale I want to own it. So today am sharing shoes that I currently love and want to add to at least one if not all to my collection. 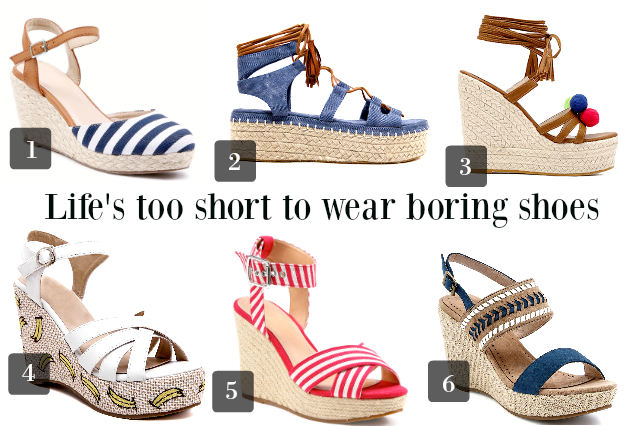 I love the striped ones and #6 is so pretty too! I love #1,# 2, and #6! I love #1. Love shoes period...but I'm a very hard fit. So when I find a style I like and which fits I keep going back to it. But I'm so not doing platform wedges anymore! Too dangerous for a klutz like moi. P.S. Dropping by from Passion 4 Fashion. Ummmm I'll take them ALL...but especially number two!